Photo Slideshow Director HD is the best slideshow software for iPhone / iPod. 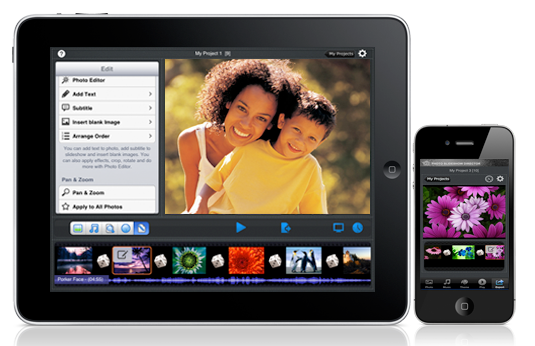 It allows you to create slideshows with pictures from iPhone albums and Picasa, Flickr, Facebook and other web albums. It is the best choice for you to enjoy and share your photo stories. With it, you can easily turn your pictures to video slideshows for watching on iPhone, HDTV, or sharing to Facebook, YouTube, Dropbox and SkyDrive. This slideshow maker also has iPad and iPod version. System Requirements: Compatible with iPhone 3GS, iPhone 4, iPhone 4S, iPhone 5, iPod touch (3rd generation), iPod touch (4th generation), iPod touch (5th generation) and iPad. Requires iOS 4.3 or later. This app is optimized for iPhone 5. Photo Slideshow Director HD allows you to create a slideshow with pictures from various sources, including iPad / iPhone Photo Library and Picasa , Facebook , Flickr, Dropbox, SkyDrive and Instagram web albums. To use photos in Web albums, there is no need to download them to iPad / iPhone first, sign in your accounts and directly get photos to slideshow projects. Wanna post your photo slideshow to Facebook and YouTube for sharing with friends? With Photo Slideshow Director HD, it is so easy to share your photos. The iOS slideshow app enables you publish to directly upload a video slideshow to Facebook, YouTube, Dropbox and SkyDrive. This iPad / iPhone slideshow maker can absolutely turn your pictures into stand-alone slide shows with its dynamic transitions and pan & zoom effects, attractive themes and background images, and etc. Besides, you can add text and subtitles to describe each picture and express your feeling. The iPad photo / video app has a built-in Photo Editor which can meet most of your photo editing needs, such as croping, rotating, apply effects, adjusting brightness / contrast, enhancing, adding stickers. Also you can save edited photos to Camera Roll. With 1920x1080 image resolution, your photos will looks great with highest quality on big TV screen when you mirror your iPad/iPhone to Apple TV via AirPlay or connect your iPad to TV with Apple Digital AV Adaptor and HDMI cable or with an Apple VGA Adaptor.